To pen a collection of recipes using ingredients gleaned from the great outdoors, you ought to have some street cred – or shall I say hunter/gatherer credibility. Author Susan L. Ebert is not only skilled at all the activities listed in the cookbook’s title, she prepares and shares these foods within her circle of likeminded friends. She’s part Euell Gibbons, wildcrafter, Michael Pollan, food philosopher, Alice Waters, natural foods proponent and Barton Seaver, chef and guardian of sustainable seafood. For Ebert, who’s all of these icons rolled into one, food – including the gathering, preparing and preserving of it – translates into being outdoors. The Texas transplant learned her skills from her Kentucky grandparents, Mamaw Grace and Papaw Dorsey, who valued the art of canning and drying their foods. As a young woman Ebert turned her attention to organic gardening, working under J. J. Rodale at Organic Gardening magazine where she learned about the dangers of pesticides and embraced the importance of caring for the earth. With a poet’s passion and an environmentalist’s commitment, she learned to fish, hunt and glean wild edibles while publisher and editor of Texas Parks & Wildlife magazine. It was then she realized, as a single mother, she could feed her two young children from nature’s all-organic supermarket. 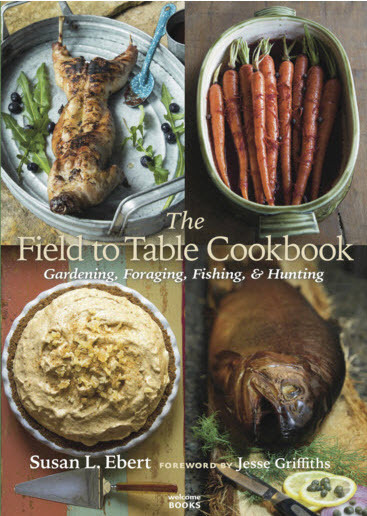 In The Field to Table Cookbook – Gardening, Foraging, Fishing & Hunting (Welcome Books – a division of Rizzoli International Publications – 2016) recipes are organized by hunting, fishing and gardening seasons. Here are 150 of Ebert’s favorite, non-GMO, wild foods recipes presented with love, humor, and a respectful compassion for God’s creatures. Dishes as diverse as Doves in Blackberry Molé, American Beauty Backstrap (Dry-Aged Venison Backstrap with American Beautyberry Cumberland Sauce), Rancho El Rey con Guajalote (King Ranch Casserole with Wild Turkey) and Peaches ‘n’ Cream Pie, tempt the cook with stunning food and landscape photographs by Robert Peacock. In every recipe Ebert shows an intimate awareness of nature’s cupboard, from pickling redbud flowers in Spring to gathering wild muscadine grapes in early Fall. Even the bourbon she chooses for her Bluegrass Country Mint Julep must be just so and from one of two distilleries that use non-GMO corn. Only Wild Turkey or Four Roses will do. For those who may not be handy with a gun, Ebert lists mail order sources for farm-raised and ethically harvested wild game, along with specialty gristmills for stone ground grains and flours. Americans are eating more rabbit than at any time since World War II. 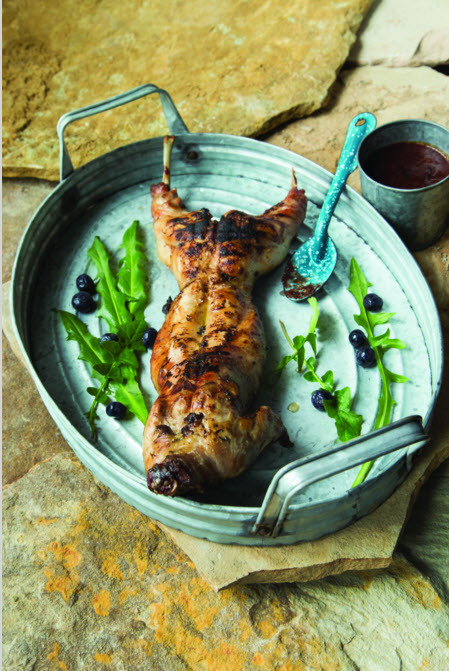 Seems trendy chefs have discovered what many hunters already know: Rabbit’s delicious white meat is high in protein, low in fat, and rich in omega-3 fatty acids. In fact, rabbit meat has a higher protein-to-fat ratio than beef, pork, lamb, chicken, or turkey, and even a farm-raised rabbit is an environmentally responsible protein choice—the amount of food and water needed by a cow to produce 1 pound of meat will yield 6 pounds of rabbit meat. Pour the cooled brine into a nonreactive container large enough to hold the rabbit, and add 4 to 6 cups ice water. Submerge the rabbit in the brine, weighing it down with a heavy plate if necessary. Brine the rabbit until about 1 hour prior to cooking, then remove and pat dry with paper towels. Place the rabbit on a wire rack over a baking sheet to dry and come to room temperature. Before grilling, brush the rabbit with some of the melted butter inside and out, and season with salt and pepper, both inside and out. Build a fire on one side of your grill (or if using gas, light only one burner) and bring the grill temperature to at least 400° F.
Baste with barbecue sauce, then loosely tent under foil for 10 minutes prior to carving. This recipe came from a plethora of blueberries (30 pounds!) after a berry-picking excursion to a nearby organic blueberry farm. While it’s exquisite with roasted rabbit, the sauce also pairs nicely with game birds, poultry, or pork. Or, as my daughter Cristina suggested, why pair it with anything? Simply drink it with a straw, or perhaps brush your teeth with it! Melt the butter in a 4- to 5-quart stockpot over medium heat. Add the shallots and sauté for about 10 minutes, until lightly browned. Add the garlic and ginger and sauté for 1 minute more. Add the tomato puree, reduce the heat to low, and simmer for 15 to 20 minutes, stirring occasionally. Place the chiles de árbol in a blender with ½ cup boiling water, cover, and let them steep for 10 minutes to soften, then puree on high speed. Add the pureed chiles, the chipotles in adobo, blueberries, salt, dry mustard, cayenne, celery seeds, cinnamon, mace, and nutmeg to the stockpot, and increase the heat to medium to achieve a lively simmer. Once the pot is bubbling, add the vinegar, agave nectar, and lemon juice and reduce the heat to low. Let simmer for 45 minutes, stirring occasionally, until the liquid is reduced by about half. Remove from the heat and let the pot sit for 15 minutes, then ladle the sauce into a blender (fill the blender no more than half-full to avoid splatters) and batch-process until smooth. Freezes well.